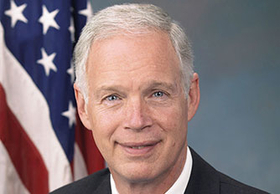 Wisconsin's Ron Johnson on Wednesday became the first Republican senator to say he opposes his party's tax bill, signaling potential problems for GOP leaders. The House passed their similar tax package Thursday, where a handful of dissidents conceded they expected to be steamrolled by a GOP frantic to claim its first major legislative victory of the year. The House Thursday voted 227-205 along party lines to approve the Republican tax bill. Eager to act before opposition groups could sow doubts among the rank-and-file, Republican leaders were anxious to hand President Donald Trump the first crowning bill of his presidency by Christmas. Trump planned to visit House GOP lawmakers Thursday at the Capitol in what seemed likely to be a pep rally, not a rescue mission. The two chambers' plans would slash the 35% corporate tax rate to 20%, trim personal income tax rates and diminish some deductions and credits — while adding nearly $1.5 trillion to the coming decade's federal deficits. Republicans promised tax breaks for millions of families and companies left with more money to produce more jobs. "It represents a bold path forward that will allow us as a nation to break out of the slow-growth status quo once and for all," said House Ways and Means Committee Chairman Kevin Brady (R-Texas) as his chamber debated the bill. "We should be working together to find ways to cut taxes for hardworking middle-class families, not taking healthcare away from millions of people just to give huge tax cuts to the largest corporations," said Sen. Bill Nelson (D-Fla.). The Republican-led Finance panel was on track to approve its proposal by week's end. It shut down Democrats' initial efforts Wednesday to modify the Senate bill, voting along party lines against amendments aimed at protecting healthcare coverage for veterans or people with disabilities, mental illness or opioid addition if the insurance mandate is ended. Johnson complained the bills were more generous to publicly traded corporations than to so-called pass-through entities. Those are millions of partnerships and specially organized corporations whose owners pay levies using individual, not corporate, tax rates. While details of the House and Senate bills differ, many pass-through owners would owe more than 20% in taxes for much of their income. Their numbers seemed insufficient to derail the bill. Asked if they could stop it, Rep. Peter King (R-N.Y.) shook his head and said, "I don't think so." Repealing the "Obamacare" individual mandate would save $338 billion over the coming decade because fewer people would be pressured into getting government-paid coverage like Medicaid. Senate Finance Committee Chairman Orrin Hatch (R-Utah) used the savings to make his bill's personal tax reductions modestly more generous. "To pay for these handouts to multinational corporations, millions of Americans are going to lose their healthcare," said Sen. Ron Wyden of Oregon, top Democrat on the Finance panel. The House measure would collapse today's seven personal income tax rates into four: 12%, 25%, 35% and 39.6%. The Senate would have seven rates: 10%, 12%, 23%, 24%, 32%, 35% and 38.5%. Each plan would erase the current $4,050 personal exemption and annul or reduce other tax breaks. The House would limit interest deductions to $500,000 in the value of future home mortgages, down from today's $1 million, while the Senate would end deductions for moving expenses and tax preparation expenses.